Florida is synonymous with nearly year-round warm temperatures, palm trees and sunny beaches. The state is made up of a peninsula, a panhandle and a chain of islands. The result is easy beach access for virtually every Floridian, and the flattest land area of any of the 50 states, with Florida's highest point only reaching about 350 feet. The Atlantic Ocean forms Florida's east coast, and the Gulf of Mexico sits on the opposite side. Regions of Florida include the First Coast (Jacksonville/St. Augustine), the Tampa Bay area, the Space Coast (Cape Canaveral/Cocoa Beach/Melbourne), the Treasure Coast, the Everglades of South Florida, and the Florida Keys which stretch from Key Largo to Key West, Continental America's southernmost point. 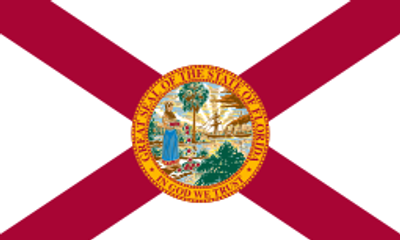 Aside from largest city Jacksonville and state capital Tallahassee in the Panhandle, Florida cities include Pensacola, Panama City, Tampa, Orlando, Daytona Beach, Miami, Palm Beach and Fort Myers. Tourist attractions include the Art Deco district of Miami Beach, the Key West Southernmost Point marker, Everglades National Park, NASCAR's Daytona International Speedway, Tampa's Ybor City district, and probably most famous of all, Walt Disney World and Universal Studios south of Orlando. Florida's Atlantic coast is served by Interstate 95, whose southern terminus is at downtown Miami. I-95's parallel through Florida is U.S. Route 1, which goes up through the Florida Keys - its south end being at the Monroe County Courthouse in Key West - then heads through the Miami-Fort Lauderdale-Palm Beach area and continues north from there until eventually reaching Georgia, as does I-95. Florida's west coast is served by Interstate 75, which actually begins in the Miami area and heads through the Everglades before turning to the north at Fort Myers and heading past Sarasota and to the east of the Tampa Bay. Interstate 10 is an east-west corridor through North Florida, connecting Pensacola to Jacksonville, while Interstate 4 connects Tampa with Daytona Beach via Orlando. Florida's Turnpike begins in Pasco County and heads down to Homestead, a southern suburb of Miami. Three-digit Interstates include I-275, I-295, I-395 and I-595. Other U.S. routes through Florida are U.S. Route 41, another Fort Myers-Miami link; U.S. Route 27, U.S. Route 301 (which ends at U.S. 41 in Sarasota), U.S. Route 17, U.S. Route 98, and the Orlando-Daytona Beach U.S. Route 192. Major Florida state highways are Florida Route 528, which links Orlando with Cape Canaveral; Florida Route 60, whose routing includes the Courtney Campbell Causeway between the Tampa airport and the Pinellas Peninsula; Florida Route 70, a Sarasota-Fort Piece byway; and the Florida Route 836 toll road outside of Miami.